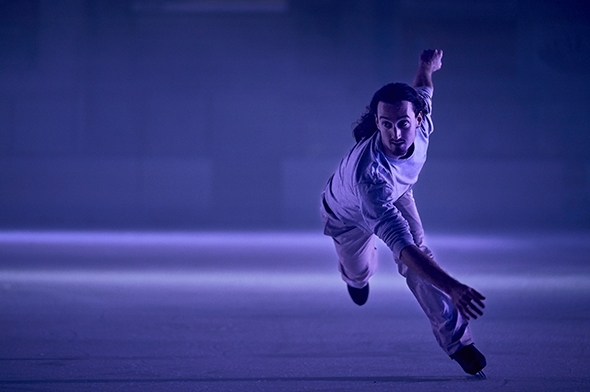 Seeing Le Patin Libre’s Vertical Influences on the ice at Alexandra Palace as part of Dance Umbrella in 2014 was a revelation, and a pleasure to see the company again on the ice at Somerset House in 2016, part reprise and part an essay of ideas for a new work. That new work, Seuil (Threshold), which premiered at Montreal’s season of international dance, Danse Danse, in April, returned to Alexandra Palace to fill the final slots in this year’s Dance Umbrella. Now in its 40th year, Dance Umbrella has a vision that looks at the outer reaches of the dance universe where the choreographic process may refer as much to ideas and cultural history as to the moving body. The stimulation of its programming questions the nature of dance by refusing to frame it, or in some cases by shredding it à la Banksy within the frame. Le Patin Libre’s visual references — the ice rink, the skates and the freezing environment — anchor it within a framework of amateur pastime or of Olympic competition but its choreographic interest lies somewhere in between. The scale of Vertical Influences derived from the sheer speed and arc of it gliding motifs and its flock patterns; in Threshold the patterns are still there but have gained additional hints of abstract narrative in which the threshold of the group dynamic is challenged. Falling out and falling — the accident — have become linked motifs and the partnering takes advantage of locking skates and elements of contact improvisation. At the same time the creative inputs of music (Jasmin Boivin) and lighting (Lucy Carter with Sean Gleason) remain familiar. One aspect of the performance that has changed is the audience perspective. For the first half of Vertical Influences the audience was seated high on one side of the rink lending the trails of speed and form a heroic stature. In the second half the audience was invited to sit on one end of the rink to watch from a different angle and the choreography was scaled, both broadly and intimately, to enhance the experience. For Threshold Le Patin Libre has eschewed heroic scale for a single, ground-level perspective for both halves of the program; the audience is divided at one end of the ice or the other. In an arena this size, the distance between the ends creates a problem of visual register: if a narrative element or one of Hamel’s virtuosic accents works for one end it is unlikely to read with the same clarity for the other. And although the choreography is not mirrored, there is an element of duplication so the performance is delivered proportionately to the two ends of the rink. Operating at the mid point of the ice is an obvious compromise, and one of the motifs that works beautifully is the gliding formation from side to side across the ice of interweaving bodies, like lines of a poem. It is the kind of motif that is unique to skating but its gliding displacement patterns could equally have their inspiration in George Balanchine’s Serenade and they have a similar emotional mystery. Nobody needs to tell Le Patin Libre — Alexandre Hamel, Pascale Jodoin, Samory Ba, Taylor Dilley and Jasmin Boivin — how to skate, but two outside influences have left their mark on Threshold, particularly on the second half. Choreographer Anne Plamondon has worked on individual vocabulary, notably a solo for Ba that extrudes his natural elegance into more classical forms, and dramaturg Ruth Little (whose Dance Umbrella Motive Force lecture is online) has carved out of the swirl of lines and speed a kind of form, be it an elegy on loss or individuality, a cinematic plot or an essay in dynamic structure and rhythm in which skating patterns form the grammar. For a company that has already pushed the contextual boundaries of skating, the question for Threshold is which way it is facing, in or out. The new work is a step forward, but still very much along the lines of Vertical Influences, suggesting Le Patin Libre may be susceptible to holding on too safely to its initial inspiration. In the spirit of Dance Umbrella, the company might consider for its next move not so much a dramaturgical ordering of internal events within their form, but an external choreographic change in concept that, while harnessing their vital energy, speed, and dynamic balance takes them further outside their frame.